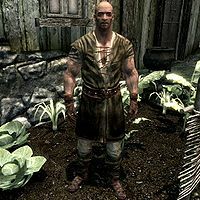 The Big Laborer is a Nord warrior that may appear as a target during the quest The Dark Brotherhood Forever at Katla's Farm. He may brush you off, saying, "Would it kill you to let a man go about his business in peace? Really, the nerve..."
The Big Laborer wears farm clothes along with a pair of boots and a pair of gloves. This page was last modified on 5 June 2016, at 11:19.